Our Sweet Perks Club is BACK!! Hey friends!! 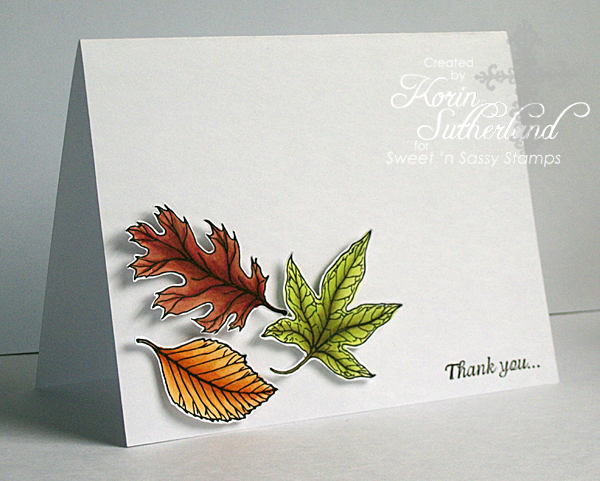 Korin here to share some exciting news with you today, but first things first...I know you really don't hear from me much mostly because I have such an amazing team of talented ladies who pump out stunning card after stunning card to share with you here on our blog, but also because I do most of the "behind the scenes" stuff, like customer service, website maintenance, and when the creative bug bites, designing new stamps. 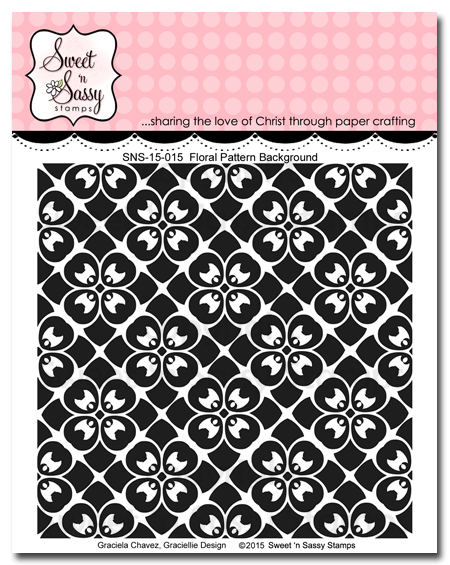 :) Since my design team is really the "face" of this company, I wanted to take a quick moment to say a HUGE thank you to them for all of their efforts for Sweet 'n Sassy Stamps, but also for their friendship. These precious ladies are each blessings from God. He uses them in my life and even in yours, through their inspiring creations, their time and love for this craft, and their prayers and support. You, too, can let them know how much YOU appreciate them by visiting their blogs (see the list on our sidebar) and leaving some love for them, or even by commenting here. They deserve so much more than this little shout out. Thank you, ladies! You are the best!! As you probably know, for the past few months we have been taking things slow here at Sweet 'n Sassy Stamps as far as ordering and releases go. Being in business can be hard. It costs money to make money and even though we are not in this to bring in big bucks, it still is a business so we have had to take a step back for a while and just pray about our future. God has been very gracious in allowing us to continue on and although we are not out of the woods yet, we are excited to share that we will be gradually adding more new products to our line again as the Lord allows. We are expecting our two newest sets, Lovely Lotus and Floral Pattern Background next week so watch for your preorders to arrive soon. 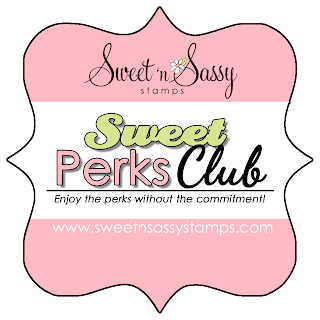 Here comes the exciting news...we are also thrilled to be bringing back our Sweet Perks Club! WOOHOO! We know MANY of you have missed our club (we did, too). We made a couple small changes, so please be sure to read the club details found here. In addition to our club being back, we are excited to share that our next release with be Friday, August 14th. Be sure to join us for a fun and fabulous blog hop right here on our blog. 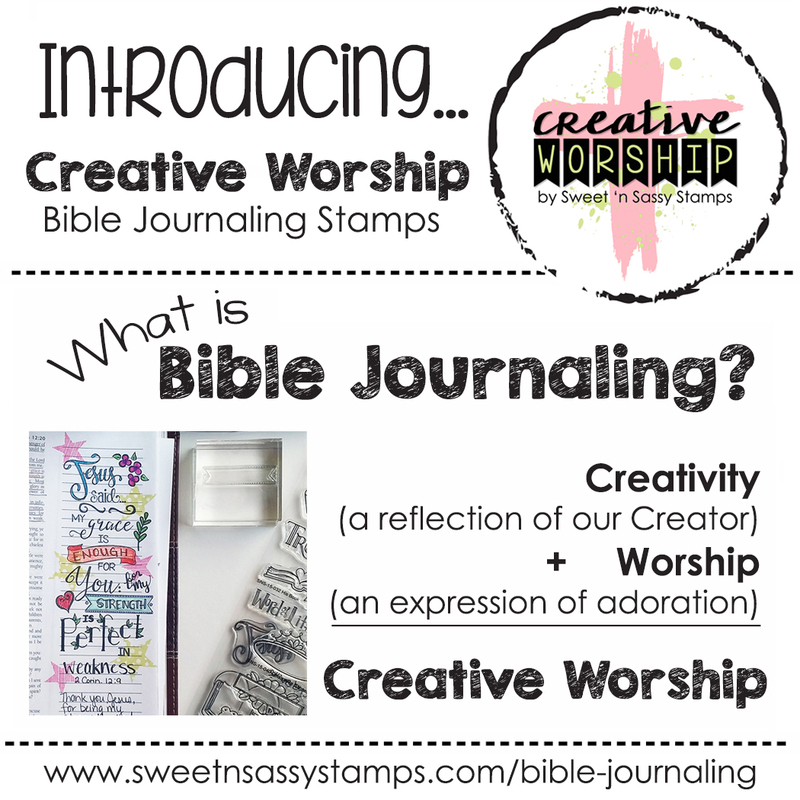 We'll have 3 fabulous new stamp sets to share with you as well as a NEW designer to introduce to you!!!! We can't wait to share!!! Hello! It's Monika here today, playing with the new sets Lovely Lotus and Floral Pattern Background. 1.I 'smooshed' pink and purple ink on my craft mat, spritzed water on it, and placed the water color cardstock over the ink puddle. 2. After the ink dried thoroughly, I stamped the Floral Pattern Background image with VersaMark, and poured white embossing powder over it. 3.I brushed off some of the powder to give the image a weathered look. 4. Then I heat embossed the image. I created my sunset by using a post it note to mask off my horizon line and sun, then sponged red, dark orange, orange and yellow inks. 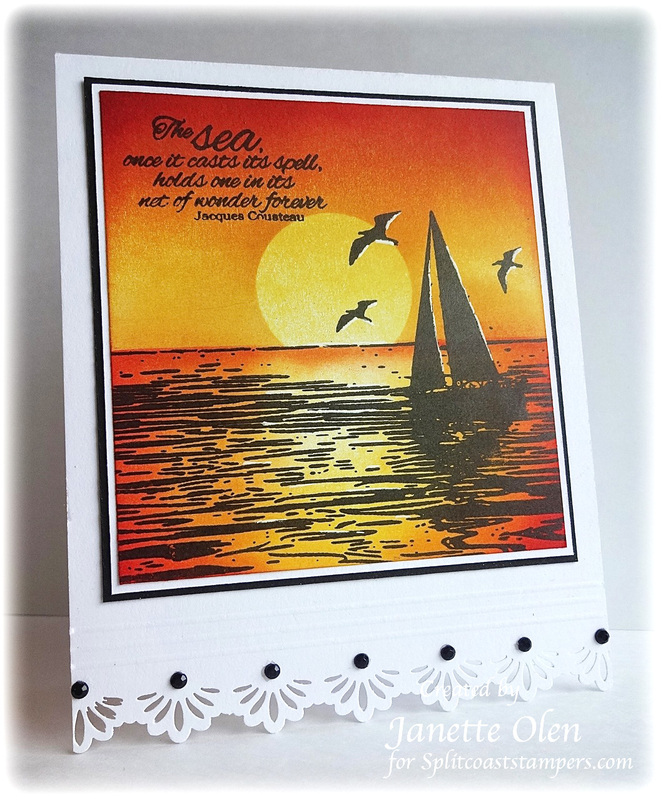 After my sponging was finished I then stamped my sea image in versa fine black ink. I used a white gel pen to add some highlights. I used a Fiskers border punch along the bottom and accented with some black pearls. Rather than matting my image with black, I added a layer of white which I think makes the image pop a little more. Hi everyone! Kim here today to share a fun photo tutorial with you, demonstrating Color Burst watercolor powders. 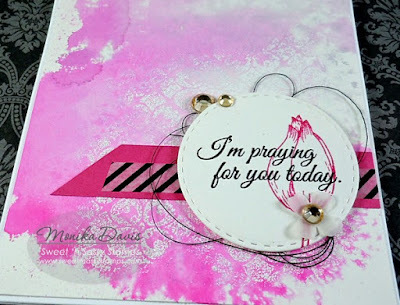 I'll also show you how you can quickly and easily make your own handmade stencils using dies. Let's get started! I'm starting with four Color Burst colors. Color Burst powders are highly pigmented, watercolor powders that react with water. Wait until you see the results! To create my stencil I grabbed the Monarch dies set and positioned five of the dies on a manila tag. Then I ran the tag through my die cut machine. 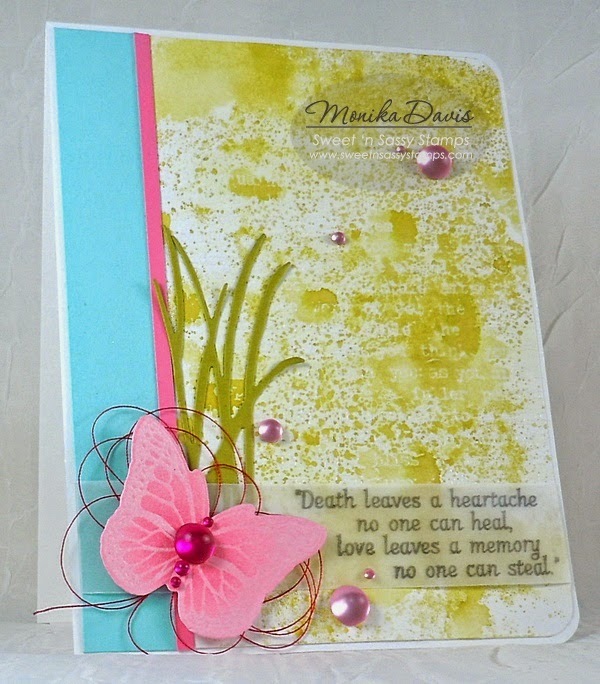 I then re-positioned a few of the butterfly dies to cut out more shapes. Here's my finished stencil! And check out all of the pre-cut butterflies I can now add to my stash! Next, I gently tapped out the Color Burst powders through my stencil and on to a piece of heavy watercolor paper. These powders pack a punch so you don't need much. I used a tiny bit of all four colors on my butterflies...and then I spritzed the entire stencil with water. Wow! Check out that intense color! It's amazing! At this point, the paper is very wet and I don't want the color to run underneath my stencil so I blotted the excess color with a paper towel. And the left over stencil isn't too bad looking either...think that's going to find a home in an art journal. 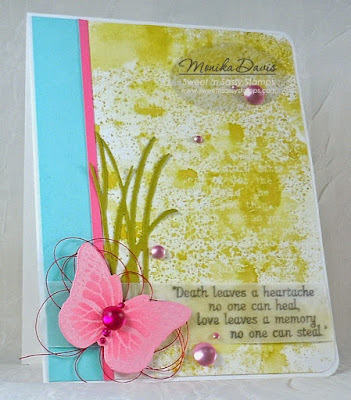 I then decided to use the Majestic Monarch stamp set to add detail to my butterflies. I'm giddy over the look of the color running beyond the stamped image...so cool. 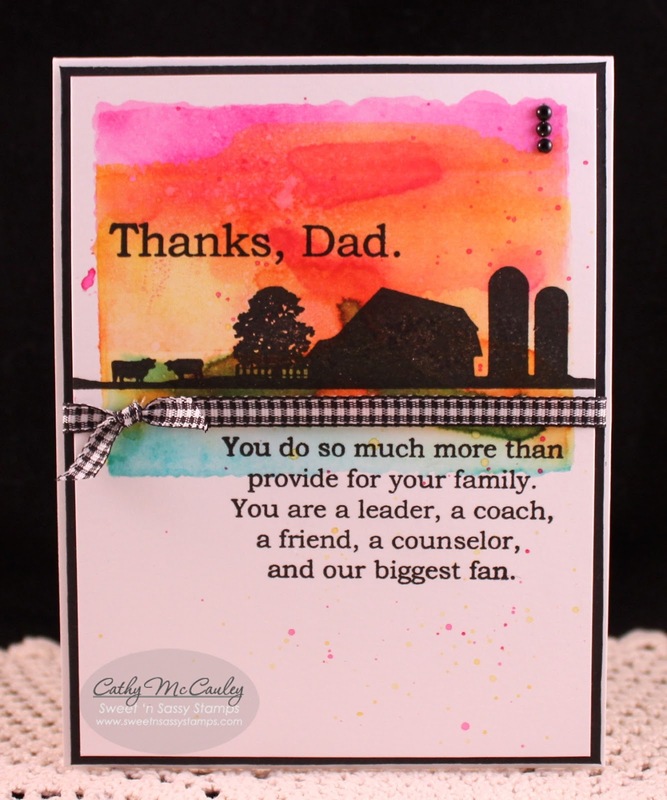 I also cut off the extra cardstock, where I had a little splashing from the powders, on the right hand side of the card. All that was left to do was finish my card! Since the butterflies were so colorful, I wanted to keep the rest of the card simple so I added an embossed piece of cardstock, and used lace to hide the seam. 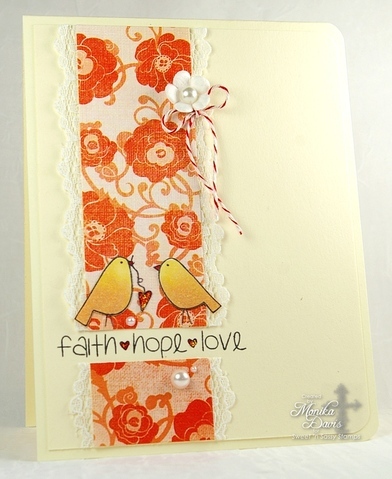 Then I die cut a small tag, stamped a brushstroke image, from the Grunge Elements stamp set on to the tag (I stamped off first so that the brushstroke wouldn't be too dark), and added the sentiment. 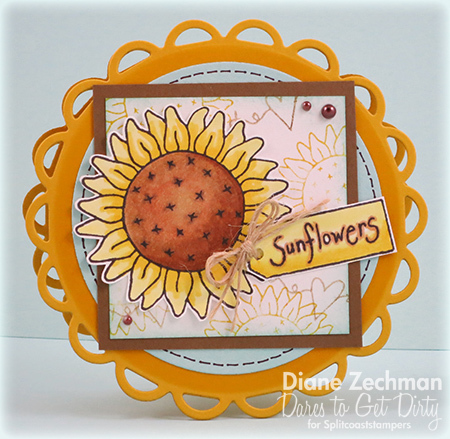 I hope you enjoyed today's tutorial and you'll try creating your own stencils with dies! Hi there, Sweet 'n Sassy friends! 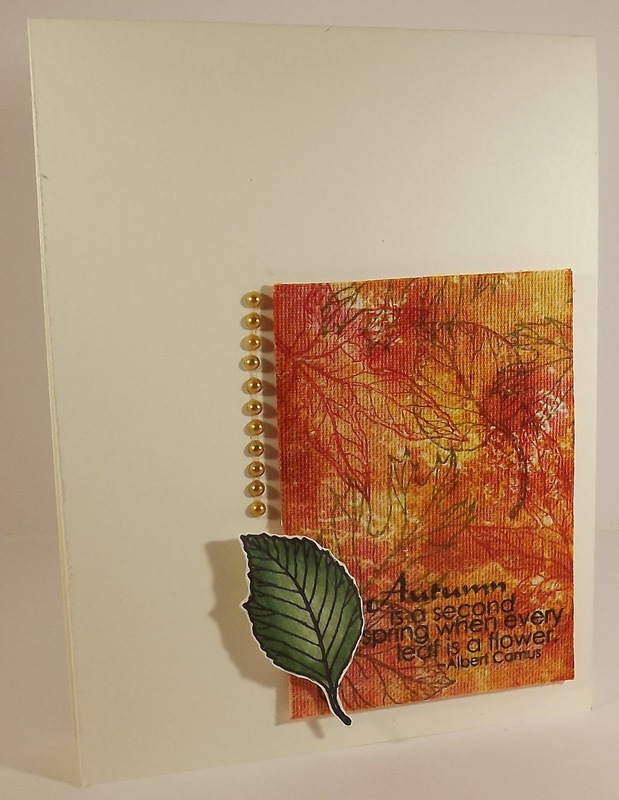 It's Ceal here to share with you a card I made using the Lovely Lotus set. This set is being released in August but guess what? You can Per-order today! To make my card I used a watercolor wash for my background and Inktense pencils to watercolor the mage. To finish it off I spritzed it with some Heidi Swapp color shine. Hello, Sweet 'n Sassy Friends! 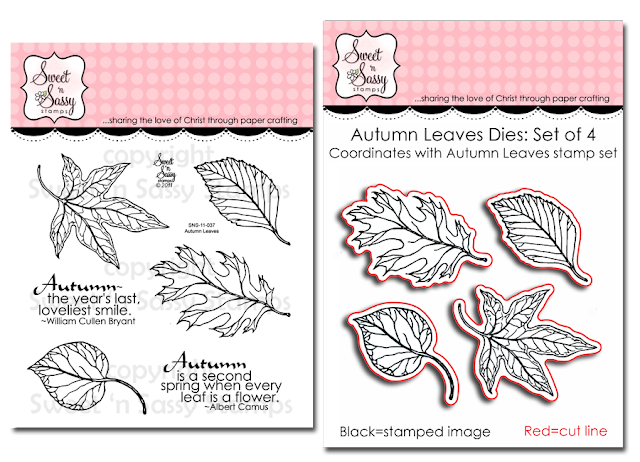 Did you know that many of our popular Sweet 'n Sassy stamp sets are now available as a pre-order? These stamp sets are so difficult to keep in stock due to the fact that they sell out as quickly as we get them in. Now is your chance to get the stamp sets you have been waiting for...beginning with our new July release, Lovely Lotus and Floral Pattern Background. 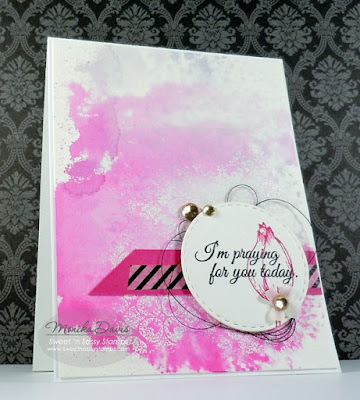 The Design Divas have been having so much fun using these two new sets this past week...Just take a look ! Some of our most popular stamp sets are the Innies. The sentiments included in these sets are perfect for the inside of your card, but can also be used on the outside! Many of these sets are now available as a pre-order. 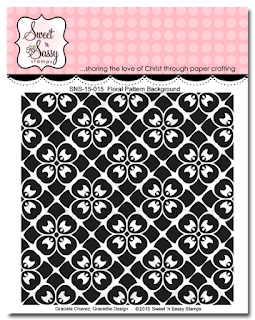 Sweet 'n Sassy silhouettes stamp sets are sought after because of their versatility. Many of these sets are also now available as pre-order items. As you can see, there's something available for everyone! Head on over to the Sweet 'n Sassy Stamps Store and pick up those favorites you've been waiting for! Don't forget to check out our Out With the Old sale. 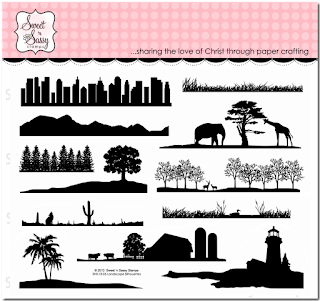 You can pick up these fabulous stamp sets for 50% off! Good morning Sweet'nSassy friends! 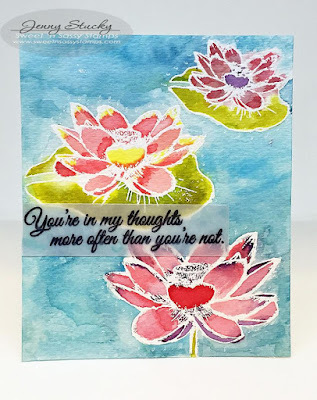 Mary here to share with you a watercoloured card! I tell you more about it on my blog. Lovely Lotus is up for pre-order in the store. It comes with beautiful sentiments/words that you can interchange. The lotus blooms come in three different size and images. Be sure to check out all the other samples using this lovely set on our Facebook Page! Hello! Angie here on this hot summer day! It's been hotter than normal here with heat indexes of 100 - 105 degrees. Ugh! I am staying inside and coloring as often as possible, how about you? 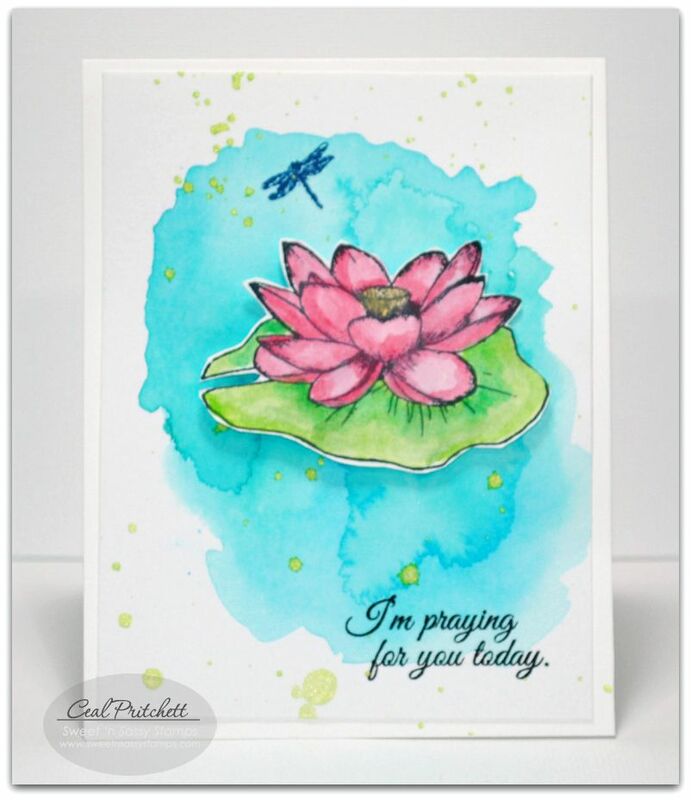 I used the gorgeous lotus flower, dragonflies and sentiment from our new stamp set, Lovely Lotus. I have two dear friends going through a very difficult time right now so I was totally drawn to this sentiment as both of them are in my thoughts throughout the day. 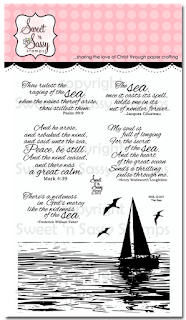 I just love the font on these beautiful sentiments and there are nine to choose from! Good morning Sweet 'n Sassy friends! 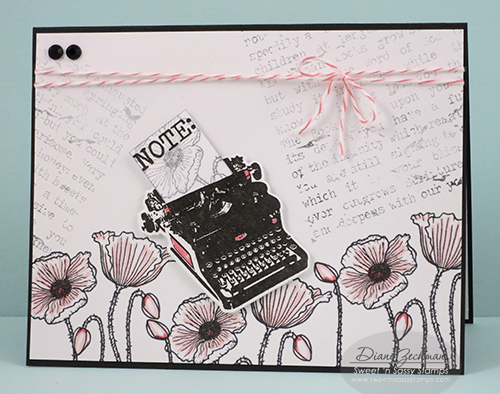 Today I am sharing a card with 2 of my favorite SNSS stamp sets combined...the Keep In Touch stamp set and Precious Poppies. 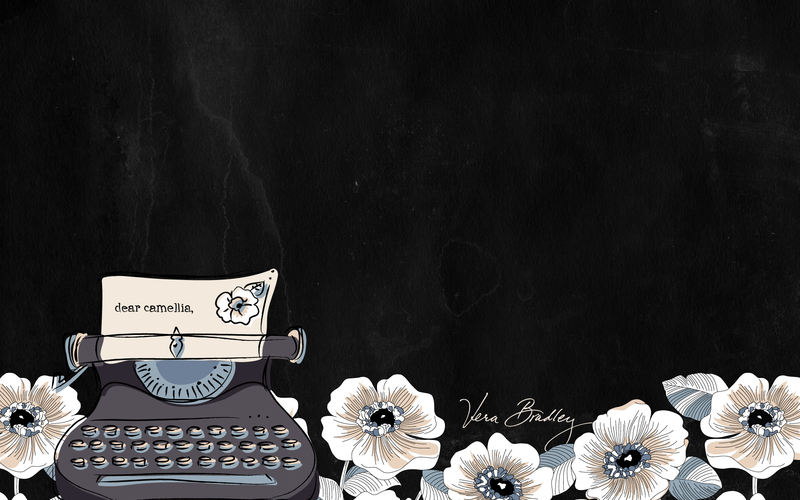 I also used the Keep in Touch coordinating dies and the Typewriter Text Background. 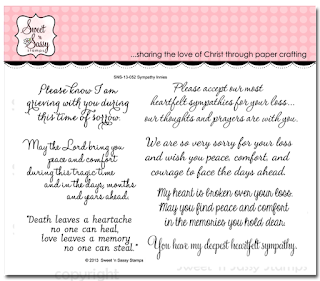 I was inspired to create this card by the Vera Bradley wallpaper on my desktop monitor. You can be inspired by many things...just look around you! Surprise! Check out our new stamps!